You have been sucker punched. As a gamer, you’ve been categorized and used as a negative stereotype to illustrate points about terrible movies. Video games and gamers get a bum rap in film criticism. Film critics seem to like to use video games and the people who play them as a culturally understood idiom. This practice makes the critics look as bad as what they might be criticizing. Roger Ebert, with his starkly ignorant opinion of video games as art, might have brought this mistreatment to a head in popular media. This lack of actual cultural awareness has been around for a long time, however, with film critics decrying just about anything that’s based on a video game or seems gamish. The trend degenerates from there, with critics using the term “video game” to condemn crappy adventure movies, as well as the term “gamer” to refer to insipid consumers of such dreck. This sort of condescension is a refuge only of someone who can’t come up with a meaningful metaphor and, therefore, takes the lazy route of uninformed comparison. Each supercilious game-movie association, like those that appear most recently in criticism on Sucker Punch, builds on social assumptions that go beyond cliché into plain falsehood. (Full disclosure: I have not seen Sucker Punch, and that fact is irrelevant to this essay.) Some game comparisons are bound to be apt, given the nature of Sucker Punch, its creator (Zack Snyder), and his history. James Berardinelli (Reelviews) says, “As each of these tasks is performed, we are catapulted into bizarre video game-inspired scenarios in which a goal must be achieved.” Other critics, such as Lisa Schwarzbaum (Entertainment Weekly), make similar proper comparisons. But the untrue notions of other critics include poor conjecture about what video games are like and what people who play them are like. Such critics lump every game and gamer into a category that likely disappeared, if it ever truly existed, when these critics were “pimply” and “adolescent”—as the Chicago Tribune mentions about some gamers. The marginalized geek exists much more commonly today as a straw man than a real person. Gamers of today are, instead, a diverse folk. The lumping in doesn’t stop with gamers, though. A.O. Scott (New York Times) lumps “video game platforms” among the materials, including drugs, you might need to construct Sucker Punch yourself. 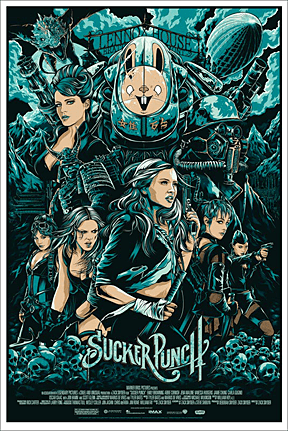 He also describes Babydoll and her cohorts, the central figures of Sucker Punch, as video game “avatars” and suggests that Scott Pilgrim vs. the World used “game logic” better as part of its narrative. Unfortunately for his mental construct, video games, their platforms, and their avatars are not all alike. Neither is game logic something that has a consistent definition. (Scott Pilgrim uses comic book methods more than video game ones, but the streams cross enough in modern expression that the point might be moot.) Further, good video games, especially good narrative games, are not cultural equivalents to poorly written or pandering action, fantasy, or sci-fi movies. The tendency for Hollywood to make bad movies based on toy and game intellectual property doesn’t allow for a critical license to reverse the relationship. Bad movies have been made from good games. Bad games have been made from good movies. The gamut extends in both directions, with an awful lot of just plain mediocre filling its creamy center. In a similar center, gamers are not all alike. John Anderson (Wall Street Journal) wrote, “The action sequences are interminable, the acting is a joke, but Sucker Punch is a movie for people who prefer video games and who may be playing them during the movie.” Tom Charity (CNN) starts his negative piece with, “Zack Snyder evidently had an awesome idea for a video game.” He sums up by saying the movie is “Schlock treatment for comatose gamers . . .” The implicit assumption, the condescension, here is that gamers not only have no taste, perhaps not even the capability of conscious discrimination that could lead to taste, but they also have no attention span. Michael Phillips (Chicago Tribune) says, “Each time the female protagonist goes into her bump-and-grind, the routine is depicted as a video gamer’s fantasy of violent combat against zombie Germans in World War I, or cyborgs, or dragons.” Which video gamer? Who is he talking about? He’s talking about his own stereotype, or what he imagines to be the archetypal gamer. This is akin to claiming poorly done romantic dramas are exactly like all romance genre fiction—a wide field with varying degrees of writing, some very good—implying that all such fiction is ill conceived and poorly executed from a storytelling standpoint. It goes further, like suggesting such “schlock” is only for 50-something spinsters who live romance vicariously through books. (My wife reads a little romance fiction.) It’s similar to marginalizing fantasy genre fiction, relegating all such writing to the realm of B-movie fantasy “schlock” and the fodder to the “Dungeons & Dragons crowd” (1), meaning, really, dateless, basement-dwelling troglodytes who are best at intellectual masturbation. It’s basing opinion on popular myth. A. O. Scott has an impressive background in literature and criticism of storytelling. John Anderson is a respected critic of film who has a long list of impressive publications and associations. Michael Phillips is similar in reputation, and is even a host of the show At the Movies. (Once Siskel and Ebert and The Movies. Phillips filled in for Ebert for a long time, too.) A number of critics have similar backgrounds in literature or film, or both, and they’re respected in their field. I’m forced, however, to wonder why they don’t stick to their areas of expertise and, instead, resort to drawing tired analogies about something they, by the tone of their statements, obviously don’t know enough but assume a lot about. Their remarks are as inappropriate and ill informed as I would be if I insinuated their mythmaking stems from most of them being born in the 60s or earlier. It doesn’t. This diatribe might seem to be rooted in my taking personal offense at the hollow categorization of games and gamers. But this isn’t about being affronted. I’m not insulted. These writers have it wrong about games and gamers, and to be truly offended, a little part of you has to believe the offender is right. I don’t believe the critics are correct. I believe they’ve let us down by making false comparisons and weak arguments based on stereotype and conjecture, revealing more about their own disdain for certain cultural elements, or willingness to appear disdainful, than their knowledge about games and movies, and game movies. That is, they failed to do their jobs. (1) Michael Goldfarb (John McCain 2008 campaign) shows similar myth buy-in, saying back then, “It may be typical of the pro-Obama Dungeons & Dragons crowd to disparage a fellow countryman’s memory of war from the comfort of mom’s basement, but most Americans have the humility and gratitude to respect and learn from the memories of men who suffered on behalf of others.” He later apologized, “If my comments caused any harm or hurt to the hard working Americans who play Dungeons & Dragons, I apologize. This campaign is committed to increasing the strength, constitution, dexterity, intelligence, wisdom, and charisma scores of every American.” Wired referred to the gaff as a “resort to ’80s-era cultural stereotypes . . .” going on to say, ” . . . once McCain masters the internet, we’re confident he’ll contemporize and start bashing video gamers instead.” I’d have stuck with the first statement. I agree with everything you are saying. I have seen the movie, and I think the comparisons to video games is just being lazy on the parts of cultural commentators. I think though, that this will go away as the current generation of critics goes away and is replaced with people more well-versed with gaming as a medium. The current tirade of critics using video games as ways to tell how bad they feel movies are is really insulting. Not because they are using one of my favorite hobbies, but because they don’t have a clue what they’re talking about. I mean when was the last time any of them stopped and actually played a video game that wasn’t Pac Man? I expect,… no, I require more from film critics. Film critics are not supposed to be stodgy old stuck in their ways morons who can’t get today’s movie going crowds. They are supposed to be progressive artsy people who take a critical but open minded eye toward movies. I don’t care if you didn’t like it, but quit using comparisons to something you have absolutely no knowledge of. It makes you look like a moron and it insults our intelligence. On a side note, I have seen Sucker Punch and my review wouldn’t be stellar, but my reasons are writing and acting not ignorant comparisons to something I don’t know anything about. Perhaps reviews of games should start making references to “games that pander to the prejudiced views of movie critics” when reviewing a bad game… make it come around full circle. Chris, if anything, you’re doing what the crew at Extra Credits have said in their ‘Facing Controversy’ video; you’re standing up to the slings and arrows. Their point was about controversy about games themselves, but attacks on gamers and gaming culture is close enough in the neighborhood. I’m offended a bit, not because I see truth in those arguments, but rather because that’s the truth my co-workers, non-gamer friends, and family are going to take from this and other like-minded arguments. Waiting x years for the gaming friendly reviewers (And lawmakers and politicians…) to get into place is all fine and good, but what are things going to look like by the time that happens? Many Film Critics have tenure (Newspaper Critics in Particular). I’m still reading movies being criticized for having MtV/Music Video styles…and MtV is older than I am…and STILL it’s referred to as a Teeny-Bopper thing. When I was studying Film, the average age of a Film critics was 40-60, a demographic not generally hip to movies based off of Nostalgia Toys or Geek influences. It’s a bit of a tangent but back in the day you had to wait for a critic to die for the job to open up. That’s changed over the past decade, thankfully. PS: Great Post. Screw Critics. Their opinion is about as useful as that guy on Twitter that you trust. More so, even. This gave me one of those “Aha!” moments, perfectly stating something I have always kind of known subconsciously but had never put into words. People who get offended by things make WAY more sense to me now. Well-written essay all around. L.A. Noire, a forthcoming video game from Rockstar, has been accepted to the Tribeca Film Festival. Not only are video games art, they are moving into the realm of high art. This is THE 21st century art-form. If you don’t recognize it yet, you have no hope of keeping up. I’m with you. Why be offended? We know that these short-hand caricatures of what people believe us to be are wrong. I still know a bad movie review when I read one. I still can see a half-hearted reference to gamers and game culture for what it is; pure laziness. I can still say that I saw the movie and have thought about it *before* I produced an opinion on it…I wonder if the critics did? ‘Sucker Punch’ is badly written, misogynistic, eye-candy. Why not just have the guts to put that in your movie review? You know…like a thoughtful, well-educated, and honest critic? So more than anything, the gaming reference in these reviews is just ignorant laziness. I’ve never really expected much else from someone who’s had no exposure to gaming culture. Especially people who’s interests lie in reinforcing consumer cultural normative standards. Sorry if I got any venom on anyone….wait…you’re article said all this already? Drat. Now I feel…silly. Excellent article as usual, Chris. It did however strike me as a little defensive. I must be honest, I haven’t seen the movie either. The gamer stereotype that gets hauled out in the reviews that you rightly criticize, shows them to be bad reviews, but surely thats all it does. If anything I believe that the main reason that the negative gamer stereotype is inappropriate is that most gamers these days are gamers and so many other things as well. I would definitely call myself a gamer. But I’m also a father, a lawyer, a South African, a martial artist, a model builder, an amateur historian and an avid reader. None of these things defines me as a person. I supppose I am really an amalgam of all these things. I dont associate strongly enough with any one of these to say that it defines me, or that I am particularly offended when someone who doesn’t really have any insight into what that element is all about, is guilty of negative stereotyping. I have probably seen more ignorant stereotyping in respect of the other aspects of my life that I have set out above, than I have of gamers. Thanks again for the article. It was thought provoking and well put together. @Michael Hasko: Thanks for that. It was a good related essay. @Jeff: I agree that games and other interactive media are the art of the coming age. The results will probably astound us. @Rob: If the essay is defensive it’s not because I identify as a gamer that strongly. It might be because I identify, somewhat, as an amateur critic. =) I did say I wasn’t offended by the stereotypes. Your points on lack of insight in stereotyping, as well as stereotyping in other aspects of your life (lawyers get it worst, I would suppose, stereotyping a little myself), are well taken. @Rob: The problem I see is that the type of stereotyping Chris is talking about, while it does point to the review itself being bad to people like us, is that unfortunately that type of mindset being put into writing/words in a review does much more. The problem I have with it is that I see it as proliferating an incorrect idea, when someone else reads that review who just had a minor impression of what games/gamers are like, they may latch onto that and begin to have the same incorrect associations themselves. Sure this is a bit of a dramatic take, and possibly inflates the damage stuff like this ever has a chance of doing, but to me it’s a real problem that needs to be contested whenever possible. It sounds like most of you have not seen the movie [yet]? Go see it. It never tries to be anything but an artist and his own form of storytelling. 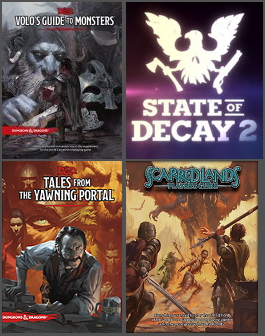 Am I “wrong” because I mix WotC Dungeon Tiles, Paizo Map Cards, Paizo glossy maps, and Dwarven Forge when I DM? 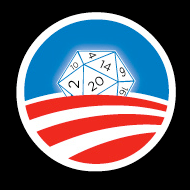 Nope… and all I run is D&D 4e. It has some charming and fun nods to certain factors of each genre it touches. It’s like, an inside joke being told among friends who “get it” and those who haven’t heard the joke, aren’t part of the inner circle, don’t “get it”. We got it. We laughed out loud, commented out loud, cheered, whooped… we had a great time. We didn’t compare it to anything but itself, and maybe vague references to the way 300 or Spartacus looks when you create a wholly digital envrionment/background. I will buy it, on Blu Ray. I won’t watch it over and over, but I will watch it every now and then to get some visual “fast food”–and since this did not set out to be drama or a love story or an epic, it works for what I went in expecting…nothing. Just went in to see what Zack would serve up, and I didn’t mind a big plate of a super bacon cheeseburger with fries! Chris – I think all I just did was repeat what you said. 🙂 A bunch of people tore this movie apart, and crammed it into stupid little labeled boxes. It *is* lazy critic work… and I would hate to be a director, under their fire. How many news sites starting tearing down his Superman film *which is barely out of casting and preproduction!!! * because “Sucker Punch” failed. Wow. If all the non-gamers out there actually looked around at media they would realize that video games and the gaming industry on the whole is slowly being more integrated into our society day by day. Critics like this that we hear about (too often to count) have lost touch with reality and believe too much in their own hype. PS. Personally, although it did lack in focus, I did enjoy Sucker Punch.